Where to start? Well, as happens to many, life got very busy the closer we got to the end of December. I stayed busy with some studio projects, but many of them were gift related so I had to keep quiet about them. At this point, I’m a little fuzzy on the order in which some of them happened, and there was a bit of simultaneous action going on, too, so none of this is guaranteed to be chronological, but I’ll try. I think the first thing I worked on coming into December that I haven’t mentioned yet is the latest book cover for L.S. Gagnon’s Thea: The Little Witch Series. I can’t remember or find the subtitle, but it was something along the lines of Thea saving Christmas. L.S. Gagnon had a fairly specific idea for this cover, which made things pretty straight forward for me. I did this in Clip Studio, which was great. It’s nice not being locked to my desk for projects that can take upwards of 30 hours. I tried to save myself some time by creating one tree, then copy/pasting it, warping it, then repeating. I adjusted the tone of each tree so that there would be some separation, but I painted all the snow caked on the branches separately, which took forever. The snow was much more tedious than I anticipated, especially considering I started on the trees in the background with all the foreground layers off. 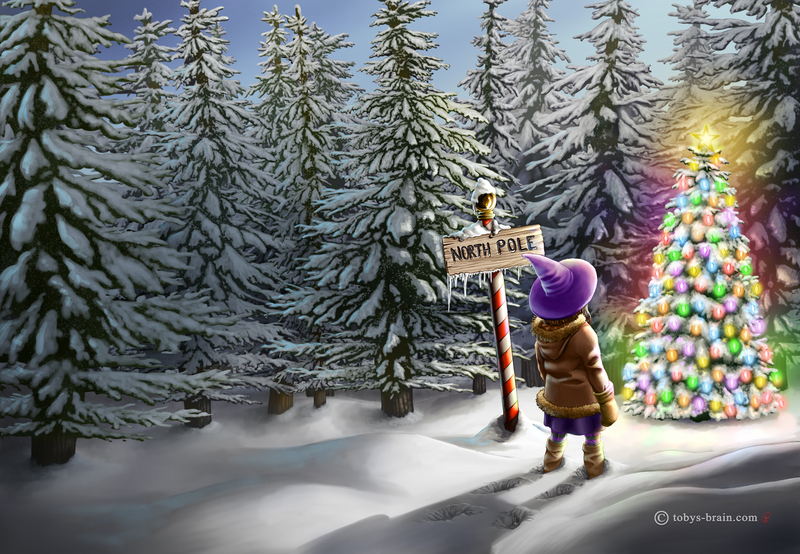 I wound up painting snow on entire trees that you only see the tops of. I’m pretty happy working in Clip Studio. The features really suit my needs, though I do miss a few Photoshop features or brushes at times. I also occasionally run into issues with the whole touch screen interface of the iPad. It’s tough to hold down a “button” when there’s no tactile way to ensure your finger is in the right place without looking. I also have issues with my fingers working in general. I don’t know if it’s dry skin, callouses, or perhaps a circulation issue, but I run into problems where my touches don’t register, or they stop registering while I’m trying to “hold down a key” to temporarily change a tool. But, other than that, it’s fantastic. I still have a lot to learn about how to fully take advantage of what the program has to offer, too, particularly when it comes to setting up and making comics. 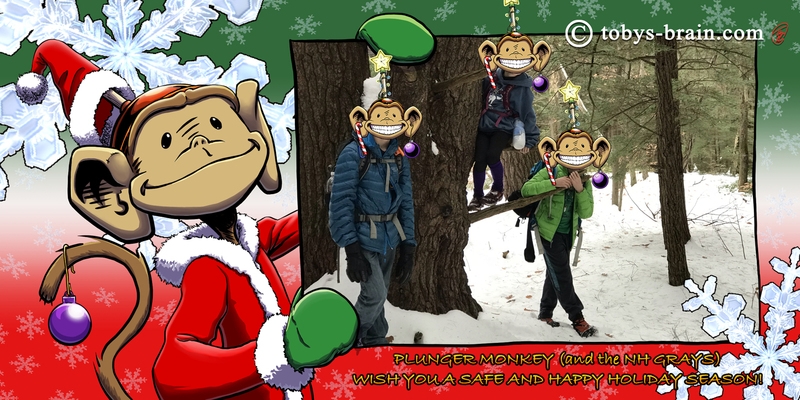 I think my next pre-holiday project was our family xmas card. 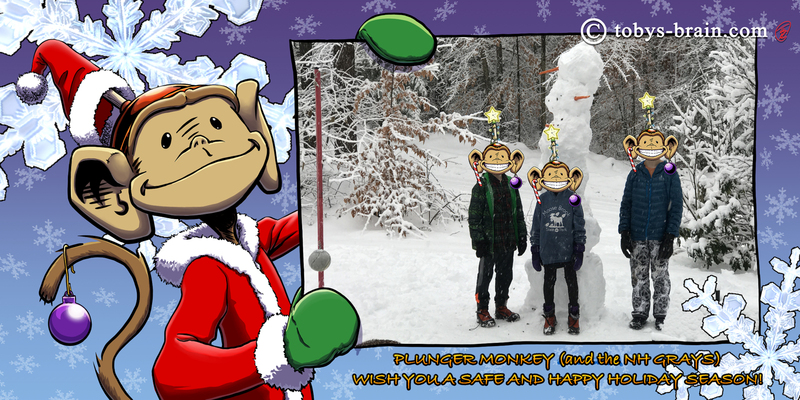 We didn’t send any out at all in 2017, as we were still overwhelmed with our son’s type I diabetes diagnosis, To make up for that and the lack of Plunger Monkey related envelopes, I decided to design my own card. Having made xmas cards, that obviously meant I had some envelopes to draw on. There are a handful of people that get one, and I have my own internal reasons for having started the tradition. It’s not a slight to those that don’t receive one, though. It’s just I only have so much time and so many ideas that I can only manage the 6 or 7 that I have been doing for years now. 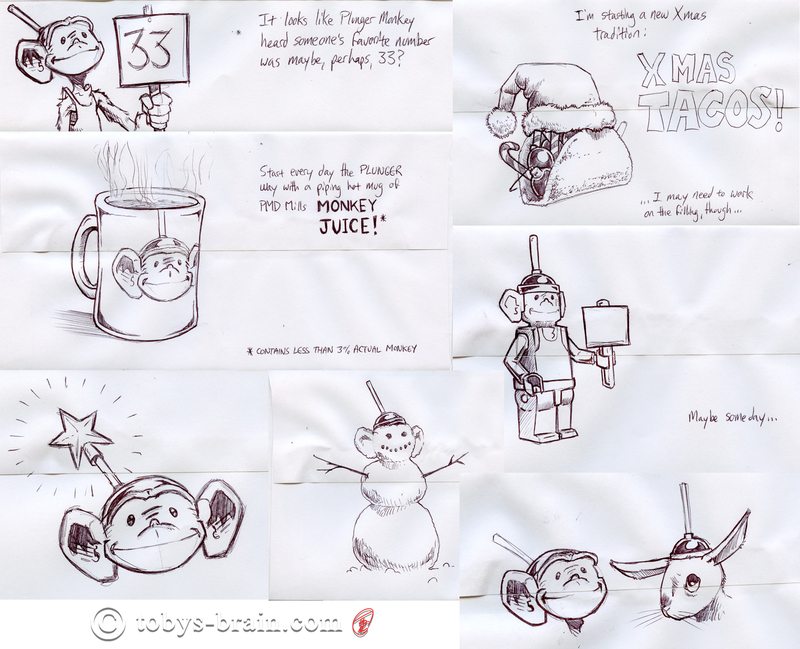 Here’s a montage of the envelope art I drew for the 2018 xmas cards. Again, I don’t remember exact dates and time frames for all of these projects, but it was sometime between late November and xmas. Sometime around now in this stream of projects is when the whole Parkour Bobcat incident took place, which inspired several shirt designs (I’m still lingering on one now, trying out different backgrounds and being wishy washy about actually calling it done and making it available). You can read all about that in the previous blog entry, but that obviously took up some time. Just before xmas 2018 (about two weeks before), my sister informed us all that she had to put her old (and last) dog Jasmine down. It was pretty heart breaking, she was such a fixture of my sister’s family for so long. 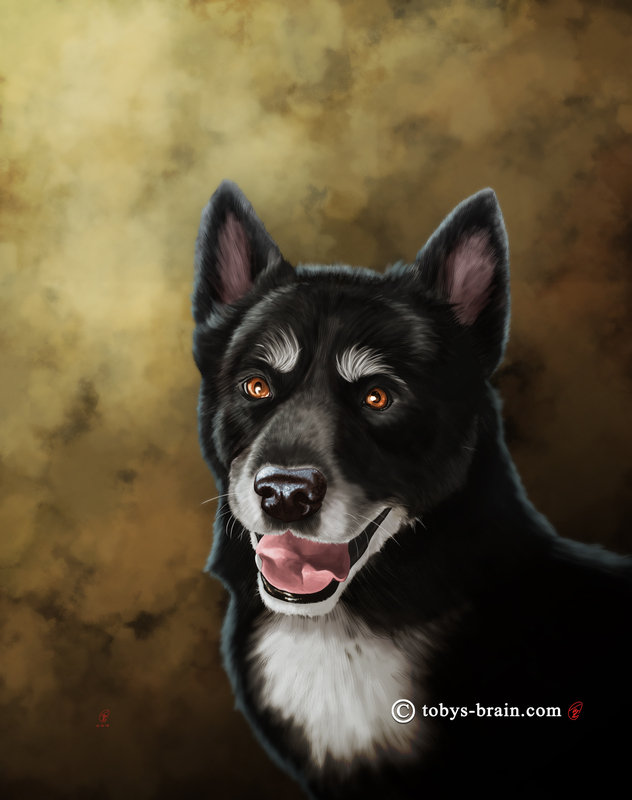 So, I did what I have taken to doing when someone has to say goodbye to a furry loved one and painted this portrait of Jas. I knew Jas well, she really was a great dog, I did my best to capture her essence in a way that photos can’t. I know the holiday season is a challenging one at the printing and framing shop I use for these portraits (Riverside Art in Fall River, MA), so with just two weeks left, I didn’t think I could turn it around fast enough for them to have it ready to give to my sister when I saw her on the 23rd. But, they are amazing and they pulled it off in a week, just in time for me to present it to my sister and her family in person. Portrait of my sister’s and brother-in-law’s dog Jasmine, that passed away just before xmas 2018. I don’t enjoy having to paint these because of the circumstances, but I do enjoy helping people remember their furry family members. Jas was a great dog. I remember visiting my parents around the same time my sister was visiting from MI. She and her husband were out for something, so I walked their dogs, Q and Jas. Jas was still relatively young at the time, and Q loved pulling. I was running around the yard with them on leashes, Q basically dragging me wherever he wanted to go. I turned to see how well Jas was keeping up, but she was lying on her side, chilling, and I was dragging here with us. Q and Jas always seemed to remember me whenever I’d visit, they will be missed. In addition to all that, I decided to make my parents an xmas gift this year. I took an oak slat from an antique bureau my father had disassembled to create this. The bureau used to be in our cabana at my happy place: Brigg’s Beach. I don’t even know how old it was, but, it holds special memories. I knew I was going to do something like this when my dad offered the chunks of wood to me. 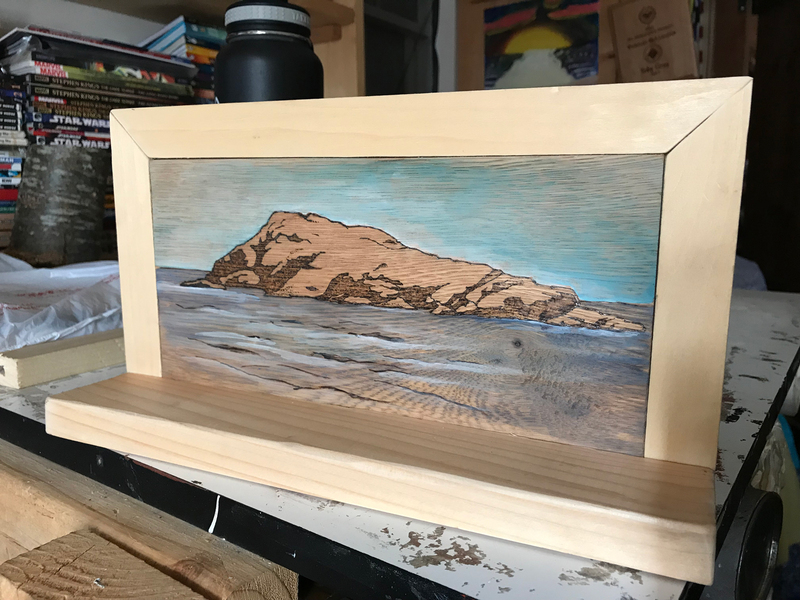 This is a wood burned and water color painting of the large Lion Rock just off the coast (you can swim to it) in the beautiful cove that is the beach. I hand made the frame/stand, which took almost as long as the art. Since the actual holiday, I’ve been busy with some other things. 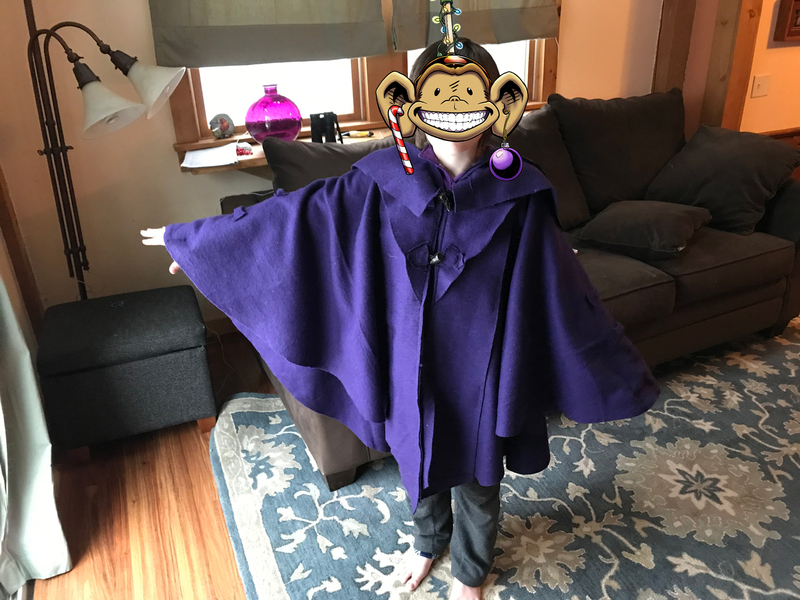 My youngest son decided he wanted a wool cape/coat similar to the ones I’ve made myself, so I spent a bunch of time making a prototype out of one of his old fleece blankets (I hate working with fleece, it’s way too stretchy). 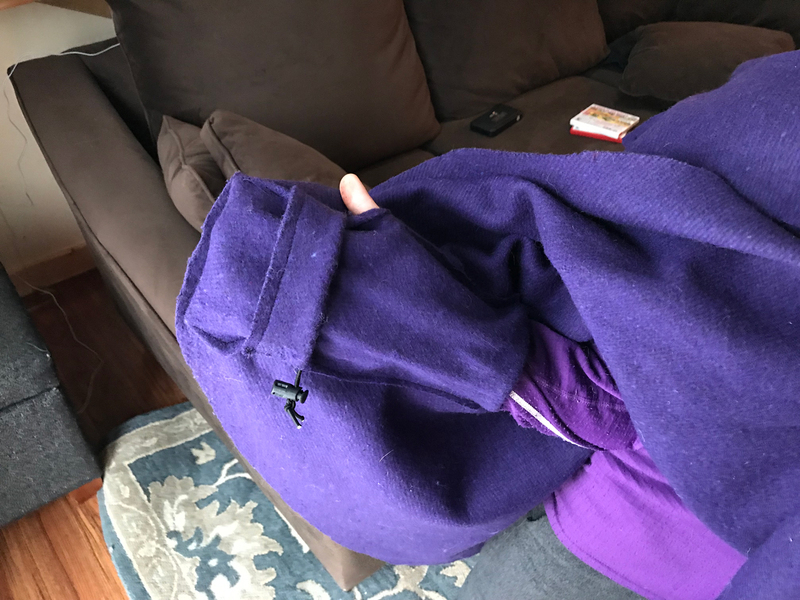 Once we hammered out some of the design features, I made one out of a purple (his favorite color) wool blanket for him. It’s also serving as a prototype for my next wool coat. Both of those endeavors wound up taking almost two weeks combined. 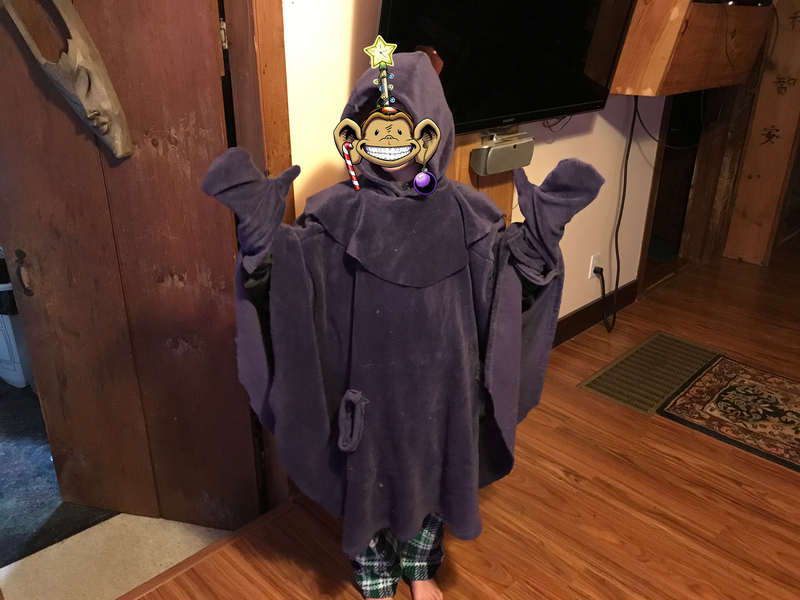 Fleece cape prototype made for my youngest son out of his old purple fleece blanket. Among other features, the fleece cape prototype had built in mittens. 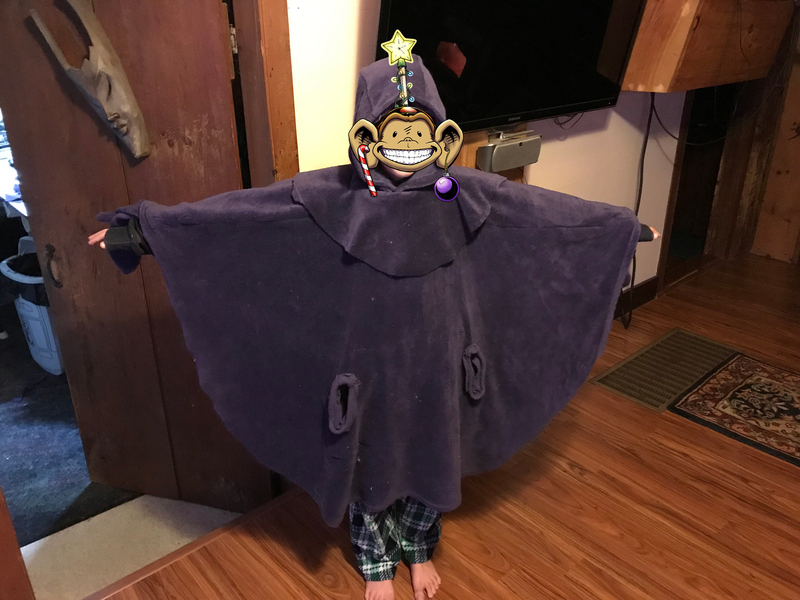 The purple wool blanket cape coat thing for my youngest son. The cape has mitten pockets (with the optional thumb hole in a seam…yes, that was intentional, not missed stitches). There’s a wrist cynch that can also act sort of like a fingerless glove if you slide your hand back. The wool cape coat has pockets on the front, both at hip and chest height. There’s also a lumbar pocket to stow a belt, that doubles as a large belt loop. There are buffalo horn toggles at the shoulders (I used them for the front closures, too) and loops at half and one third down the “sleeve”. 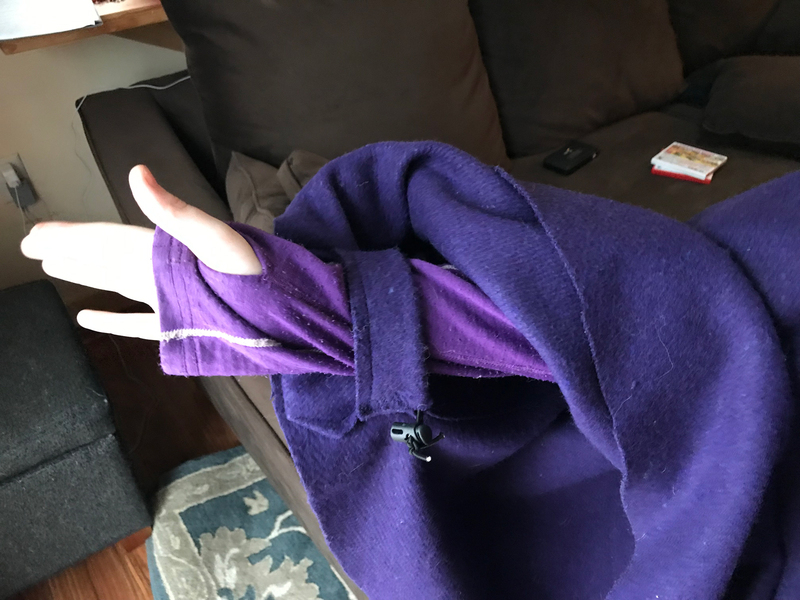 If you need to get the sleeves out of the way due to being too warm or for mobility reasons, you can fold and button them out of the way. After the sewing stint, I decided it was time to bang out the letter to my dear friend, 97 year old WWII vet Lou. He’s been a friend of the family since serving with my grandfather. I first met him in 2000 when I attended my first WWII reunion with my grandfather and family and I’ve tried to stay in touch ever since. I keep a special folder on my computer and I fill it with photos to include in my letters. Unfortunately, life got out of control busy, so the last letter I sent him was almost a year ago. That meant I had 340 some odd photos for my letter! I did trim it down, but the whole thing clocks in at 38 pages. I write in Photoshop so I can drop pictures in, almost scrap-book style, which he has said he enjoys. It took 3 plus days to finish the letter and get it off to a printer. So, what’s next? Well, I really need to just come to a decision about that shirt design and be done with it. 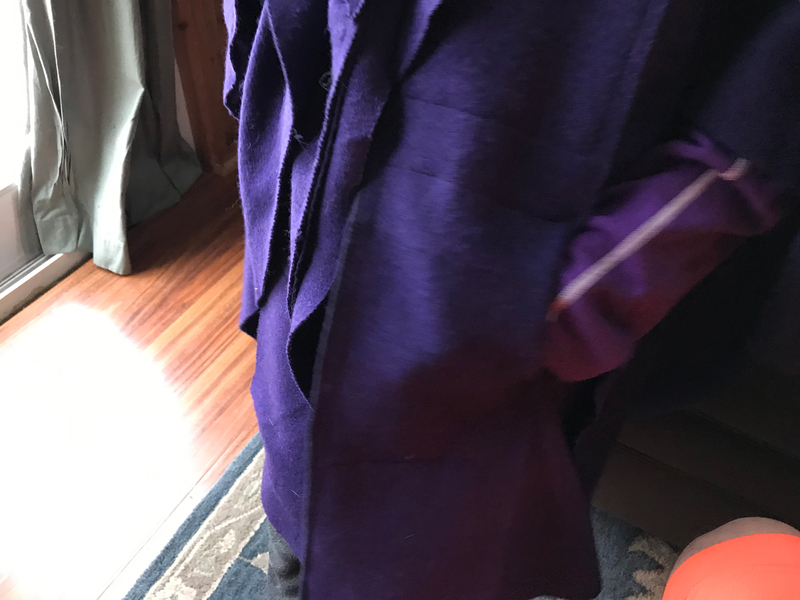 I want to make my next generation wool coat thingy for myself (my wife is supposed to want one, but she may be changing her mind on me), one of my other sons wants one too, I think. 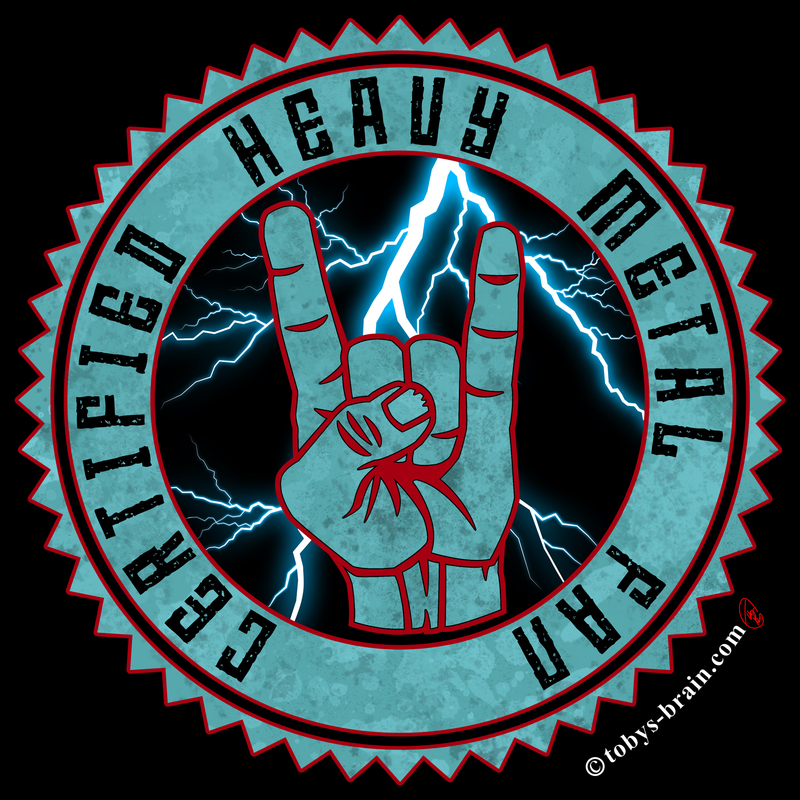 I want to finish designing and then build my ultimate every day carry bag thing, as that seriously occupies way too much of my brain. I’m planning to take serious steps to getting 10 Things out and available (I know, I have said that so often it’s basically a joke), and I’ve set some tentative target dates for working on some of the graphic novel projects swimming around my brain. I’m not one to make new years resolutions, as I find the day itself to be kind of arbitrary when I think about it. Still, we can all benefit from setting concrete goals with timelines attached, so I’m going to give that a try. We’re only in our 3rd week of the year, so so far I think I can say I’m still on track. I may have to shuffle some plans around, though, as many of the things on my list aren’t necessarily pure art related (though still goals), so I haven’t made a ton of new art these first few weeks and I’m starting to get antsy.